BB-200 Hydraulic Pipe Benders: Izumi Products. 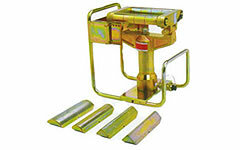 The BB-200 is the high pressure hydraulic bus bar bender for portable use. The BB-200 powered by 700 bar or 10,000 PSI hydraulic pump is ideal for non-production work such as substation construction where custom bending is required at the job sight. The BB-200 comes complete with 4 different baending bars for four different bending radius. 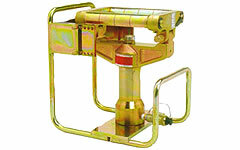 The unit requires a 700 bar or 10,000 PSI pumping source for operation. Bending angle: Max 90 degrees. 4 Bending bars, Steel carrying case.